I just picked up a 97 XP that had a brand new motor installed. It only ran for 2 hours before I picked it up, but the only problem with it was the gas gauge read 0 all the time. So look all over inside the hull and cant figure out where the other end of it goes to. I decide to move the seat over and look at the top of the baffle. But there is still no cable. Can anyone help? I tried looking for pictures of a baffle out of a ski where it shows where the cable comes from, but have come up with nothing. I'm just looking for a pic similar to this one found in the sticky at the top of the forum. Just more close up to see where the cables come out of the baffle. Thanks! the wires come out underneath the rubber. they were probably clipped off at one time or another. if there is anything left coming out of the baffle you might be able to solder new wires on there and make a new plug connection for the sender. So what does everyone do for the replacment fuel lines? How much do they run? I have been having problems with my GSXL and noticed they are still the gray ones. Also what are symptoms of bad lines besides visually inspecting them for deteriation? Thanks! 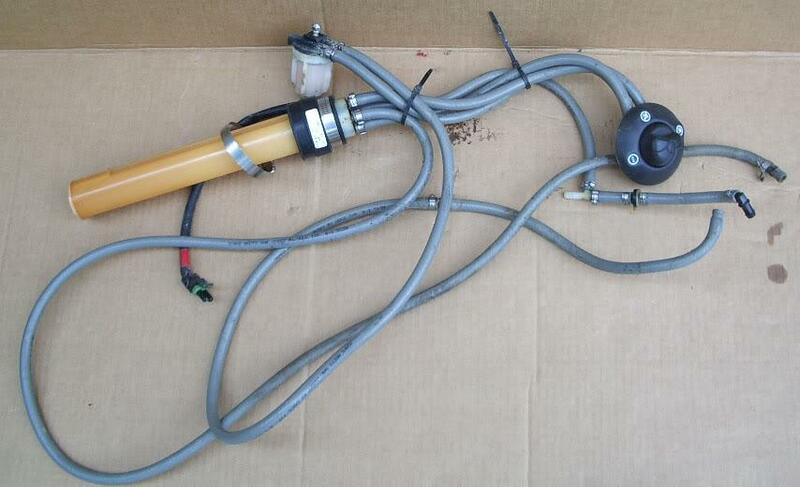 Gates (non-FI) fuel line from NAPA at ~$1/foot. The GSXL uses 3/8" for the ON and RES lines and 1/4" for the RET and inter-carb lines. You should not have to change the Vent or Pulse lines. Thats not a fuel baffle. Thats a pipe that runs from front to back... Possibly the exhaust pipe? I'm new to pwc's. Are those the same for the 97 XP too? The pipes called a stinger tube. It's what connect the actual pipe to the waterbox. Yes, those fuel lines will work for you. Awesome! NAPA or any auto parts store should have those end fittings too right? Thanks for your help guys!